The Asia Cup will be played between September 15 and 28, with six teams featuring in the tournament. Bangladesh will kick-start the main round of the 2018 Asia Cup with a game against Sri Lanka on September 15. Pakistan plays Hong Kong on September 16 while India will kick-start their campaign with a match against Hong Kong on September before they face off against Pakistan on September 19. The teams are divided into 2 groups. The top two teams in each group will then qualify for the Super Four stage where each team will play three games each, including one against the team qualifying from their own group. The top two teams from this Super Four stage of the tournament will qualify for the final that will be held on September 28. Asia Cup schedule 2018 is placed below. Note: All matches will be played at 3:30 PM local time / 4:30 PM Pakistan time / 5:00 PM Indian time / 11:30 AM GMT. Five of these six teams get a direct entry into the competition – Afghanistan, Bangladesh, India, Pakistan and Sri Lanka – while there were six other teams that played in a Qualifier to win that elusive sixth spot. Hong Kong overcame the challenge from Malaysia, Nepal, Oman, Singapore and UAE to win the Qualifiers. Here’s how you can watch the Asia Cup 2018 live on TV or on your computer. Asia Cup cricket 2018 team squads are placed below. All these teams will thereby play two games in the group stage of the competition and the top two sides from each group at the end of this league stage will qualify for the second round. The second round is a Super Four stage, one that will see all four teams feature against each other once. At the end of this round, the top two teams will qualify for the final. The Asia Cup will be broadcast on different TV channels in different countries participating in the tournament. For instance, PTV and Ten Sports could get the rights to telecast the Asia Cup in Pakistan whereas Star Sports might show the tournament live in India and Sri Lanka. How to Buy Asia Cup Tickets UAE? India enters the competition as the defending champions, in an Asia Cup tournament that was, for the first time, played in the T20 format. This particular edition will be played in the ODI format in the lead-up to the 2019 World Cup. 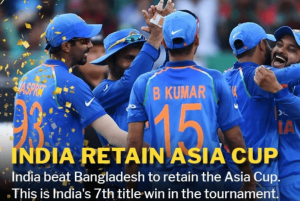 Of the previous 13 times the Asia Cup has been played, India has won the competition most number of times at six, while Sri Lanka is the second-most successful side with five titles under their belt. Pakistan has won the competition twice, in 2000 and in 2012, beating Sri Lanka and Bangladesh in the finals. Bangladesh has made the final twice. Interestingly with the 2019 World Cup less than a year away when the Asia Cup squads will be announced, this tournament could be used as a warm-up for that competition in the UK next year.